A generation away from the controversies surrounding the photography of Robert Mapplethorpe, art historian Germano Celant has released Robert Mapplethorpe: The Nymph Photography that surveys the photographer’s aesthetic career and puts so much in perspective about the artist and his work. It is in many respects a revisit of unfinished business. Mapplethorpe was emerging as one of the most important art photographers in the world at the time of his death from AIDS in 1989. He posthumously became a cause célèbre, thrown in with the NEA four gang as being, among other things, politically tagged as subversive pornographers supported by public arts monies. Mapplethorpe was summarily vilified in the Senate chamber by the infamous antigay bigot Jessie Helms, who made copies of Mapplethorpe‘s most explicit photographs and mailed them to members of Congress. The pressure caused the Corcoran gallery in Washington to cancel their planned installation of Mapplethorpe’s exhibit “The Perfect Moment,” already enjoying sensational success at galleries in Chicago and Philadelphia. This assault on art by homophobic politicians galvanized the art world against government censorship and made the exhibit a must see (it was even projected on the side of the Corcoran building at one point). 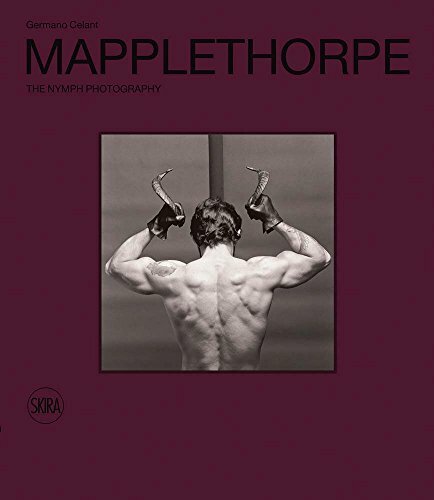 Mapplethorpe’s “The X Portfolio” of graphic imagery exploring, among other things, gay male S/M scenarios, fetishism, and all around adult fare, was subsequently shown everywhere and still studied today. Mapplethorpe never denied that some of his photography was pornographic as a layer of aesthetic intent. Celant opens up that discussion in The Nymph Photography, revealing Mapplethorpe’s artistic philosophies, his visceral connections to his subjects, and his synthesis of art history. Celant a was friend to Mapplethorpe, and he includes transcriptions of a conversation he had with Mapplethorpe circa 1983 talking candidly about his describes his artistic process. “I learned a lot about my sexuality, both by participating and taking pictures.” or “I consider these pictures part of a diary.” and “. . . to me taking a photograph is venturing into abstract territory.” With sexually graphic content, Mapplethorpe worked with friends, not hired models, and considered himself a protagonist, rather than a removed, objective eye or voyeuristic presence. “The photographer therein saw a value and a direct knowledge, in the first person, like Caravaggio, he did not intend to pass judgment or interpret reality, whether ugly or beautiful, rather to ‘illuminate’ it,” Celant writes. There have been many Mapplethorpe volumes that usually group his photographs—flowers, still-lifes, nudes, celebrities, and classical statuary—separately, but in this volume they are considered together. The arrangement of the photographs in the book is supported by text by Celant, most culled from previous catalogues by Celant of Mapplethorpe exhibits. This Skira 9.75 X 11.25 volume is handsomely formatted and features several full-page reprints of Mapplethorpe’s work, with fine plate transfers. The text though has some sloppy editing and typos, which however minor can puncture Celant’s otherwise eclectic prose. A minor point really, in light of this powerful collection of Mapplethorpe photography. Some of the most dramatic and touching are the self-portraits that now are permanently installed as 20th century classic photography.